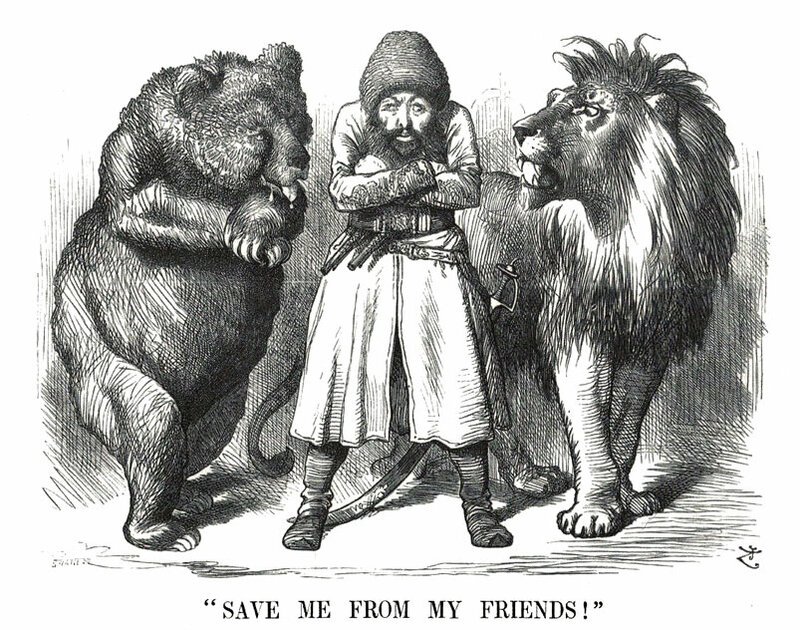 In 1839, Arthur Connolly, an intelligence officer with the East India Company, described the competition between Great Britain and Russia for control of Central Asia as “the grand game,” and the phrase became widely popular as “the great game” after writer Rudyard Kipling used it in Kim, a novel published in 1901. The rivalry dated from 1813, when (after a lengthy conflict) the Russians forced Persia to accept their control of much territory in the Caucasus Mountains region, including the area covered by modern Azerbaijan, Dagestan, and eastern Georgia. 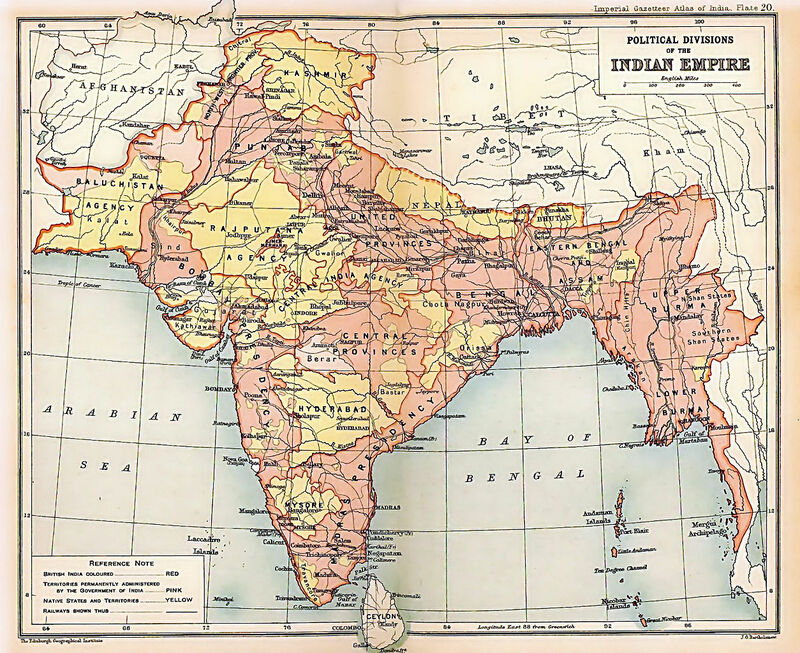 British politicians feared that the tsars’ expansionist ambitions would carry them further south and threaten the commercially and strategically important imperial possessions in India so the government attempted to make Afghanistan a buffer state that would prevent Russian armies from attacking through the Bolan and Khyber Passes in the Himalayas. In the early 20th century, the struggle extended to Persia and Tibet, but by then both powers considered Germany a growing threat so on 31 August 1907, in St. Petersburg, they signed an entente that circumscribed their areas of influence in Persia and ended Russian contacts with the Afghans. In 1917, the communist revolution changed the nature of power in Russia and in 1919 Britain ended Afghanistan’s protectorate status, leaving the Afghan leaders free to sign a treaty of friendship with the Soviet Union in 1921. For 20 years, both sides continued to woo the Afghan rulers, but World War II led to cooperation, rather than competition, and ended the struggle for influence. While Russia expanded into Central Asia in the early years of the 19th century, British governments worried that its tsars would use Afghanistan as a base for launching attacks on imperial possessions in India. As early as 1809, Great Britain negotiated a defense treaty with Shuja Shah Durrani, the self-proclaimed king of Afghanistan, in the hope of deterring potential aggressors. Soon afterward, Shuja was deposed, but in 1839 Britain used East India Company troops to restore him to the throne, primarily because the governor-general of India, George Eden, earl of Auckland, believed that the installation of a puppet ruler over the lands to the north of the Bolan and Khyber Passes would prevent Russia from advancing southward through the Himalayan Mountains. However, most Afghans resented both the foreign army and the monarch it imposed on them. In November and December 1841, that resentment flared into violence when several British officials were murdered, but to the disgust of his officers, Major-General William Elphinstone, the officer in charge of the army garrison in Kabul (the Afghan capital), failed to punish the culprits or take any other action until 6 January 1842, when he ordered a withdrawal. The 4,500 soldiers and their 12,000 administrative personnel and dependents headed for Jalalabad, some 90 miles away, but were trapped by tribesmen and massacred. Later in the year, troops led by Major-Generals William Nott and George Pollock exacted reprisals, burning stock and villages and destroying the bazaar in Kabul before retiring to India, but, even so, the imperial power’s image of invincibility was badly dented. Despite the loss of prestige, many politicians in Britain (and particularly those in the Liberal Party) continued to consider Afghanistan an important buffer between tsarist expansion and British interests on the Indian subcontinent (1804–1881)). That world-view led to a second conflict in 1878–1880 after Sher Ali Khan, the emir of Afghanistan, refused to meet a British diplomatic mission because he wanted to maintain a policy of political neutrality rather than align with any major European power. Britain responded with a 40,000- strong invasion force that left Mohammed Yaqub Khan (the emir’s son and successor) with no option but to sign a treaty, on 26 May 1879, that made his country a British protectorate, surrendering all rights to negotiate with foreign governments and ceding territory in return for assistance to resist aggressors “in whatsoever manner the British government may judge best.” Following a rebellion later in the year, Britain replaced Yaqub Khan with his cousin, Abdur Rahman Khan. For nearly four decades after that conflict ended, British officials maintained cordial relations with the Afghan leaders, who seemed willing to accept the restrictions on their external relations in return for financial help and freedom of control over domestic matters. However, in 1919, Amanullah Khan, Abdur Rahman Khan’s grandson (who had assumed control of the country after his father, Habibullah Khan, was assassinated in February of the same year), took advantage of political uncertainties caused by the Bolshevik revolution in Russia and by civil unrest in Britain’s Indian Empire to build support for his rule by promising to make his country fully independent of British influence. On 3 May, he marched his army through the Khyber Pass and occupied the strategically important village at Bagh (now in Pakistan). British and Indian troops recaptured the settlement on 11 May then pressed on into Afghanistan, supported by aircraft that bombed Jalala- bad and Kabul. Amanullah sued for peace on 31 May, but Great Britain, its armies much weakened by the effects of World War I, was in no mood to assert itself. On 8 August, at Rawalpindi, it recognized Afghanistan’s independence and gave assurances that it would not attempt to extend its Empire north of the Khyber Pass. Even so, independent-minded tribesman continued to cause problems for Britain along the northwest frontier between India and Afghanistan, and those problems were inherited by Pakistan when it became independent in 1947. By early 1943 enough evidence had accumulated in Britain of German secret weapon development to alert several of the responsible authorities to the danger of pilotless weapons – or other forms of long-range attack. The authorities included R.V. Jones, who advised the Secret Intelligence Service (MI6), as well as the Air Ministry, and who enjoyed the Prime Minister’s favour as the ‘man who broke the beams’, the Luftwaffe’s radio guidance system during the Blitz of 1940; Professor C. D. Ellis, the army’s scientific adviser; Dr A. D. Crew, Controller of Projectile Development at the Ministry of Supply, the British equivalent of Albert Speer’s Armaments Ministry in Germany; General Ismay, Churchill’s personal military staff officer; the Joint Intelligence SubCommittee, which co-ordinated the work of MI6, MI5 (the internal security service) and Special Operations Executive (SOE), Churchill’s subversive organisation overseas; and the government’s Scientific Advisory Committee. Too many fingers in the pie, no doubt; but the crucial initiates were Lord Cherwell (Professor F.A. Lindemann), Paymaster-General but holding that post as Churchill’s personal and long-time scientific adviser, and Duncan Sandys, since 20 April chairman of the committee, soon to be known as the Bodyline, then Crossbow Committee, charged with overall responsibility for investigation of the secret weapon threat. Churchill believed in ‘creative tension’ as a principle of administrative efficiency, the fostering of rivalries between government servants to generate energy in the examination of problems and the keenest critical response. It was a sound principle, as long as normal personalities were involved. There was nothing normal about the personalities of Sandys and Cherwell, or in turn about their relationship with their overlord. Sandys was an ambitious young politician of grating disposition, who had a possessively filial attitude to the Prime Minister. Cherwell, a rich bachelor scientist of exceptional intelligence, also had a possessive attitude towards Churchill. Never quite at home in England, though he was a Fellow of the Royal Society, an Oxford professor and a resident of Devon, he seemed unable to shrug off his sense of foreignness, the product of German birth and education, burning British patriot though he was. He had attached himself to the Prime Minister during Churchill’s wilderness years, adulated him personally and jealously guarded his own status as the medium through whom Churchill received scientific advice. The appointment of Sandys to head the secret weapons committee touched him to the quick. Observers noted that – discreetly heterosexual though he undoubtedly was – he trembled with an almost feminine indignation at the slight. The regrettable outcome was that, because Sandys early espoused the idea that Nazi Germany was indeed developing a long-range rocket, Cherwell grasped at every strand of his extensive scientific knowledge to decry the thought: liquid fuel was unmanageable, only a solid-fuelled rocket would work, it would have to be a multi-stage monstrosity, its launch sites would be so large as to be undisguisable, it probably existed only in the minds of unreliable foreign agents. The idea, he argued in a phrase that inextinguishably attaches to his considered advice, was ‘a mare’s nest’. The secret weapons intelligence plot, between the first deliberate overflying of Peenemünde by RAF photographic intelligence aircraft in April 1943 and the arrival of the first pilotless weapon on British soil on 13 June 1944 (a flying bomb, not a rocket), was therefore bedevilled at every turn by reasoned disagreement between the parties to the investigation. To his credit, Cherwell never dismissed the feasibility of a cruise missile (the flying bomb). Indeed, he argued that, if a pilotless weapon threat existed, it was probable that it would take a cruise missile form. Because, however, agents’ reports of the V-1 came later, while evidence of the rocket threat, however vague and misleading, came earlier and more plentifully, the British were both misled and caused to disagree among themselves. The disabling weakness of the German secret weapons programme was to attempt to do too much with too little; the British were further confused by the German investment in a multi-stage long-range gun (the ‘high-pressure pump’) and a rocket-propelled anti-aircraft missile, the Wasserfall (Waterfall). The weakness of the British intelligence counter-attack lay in an absence of practical knowledge of rocket or cruise missile technology and so a lack of clarity in their attempt to perceive what it was they were seeking to identify. The very wealth of intelligence received during April, May, June and July 1943 – from agents, prisoner-of-war interrogations and air photographs – required laborious analysis but in its diversity and imprecision provided something for anyone who had taken up an intellectual position on the nature of the threat or who denied its reality. Among those contributing were a captured German tank technology officer who co-operated so enthusiastically with his interrogators that he was appointed a British civil servant and posted to the Ministry of Supply as ‘Mr Herbert’. He had information on anything he was asked about including, eventually, the German secret weapons programme. He claimed that he had been involved in the development of projectiles weighing a hundred tons, launched either from a tube or a ramp. A senior officer of the Luftwaffe experimental unit, captured in April, told of his superior, Colonel Rowehl, being summoned to see Hitler at Berchtesgaden to discuss the bombardment of Britain with rockets and jet-propelled aircraft in the coming summer. ‘Mr Herbert’, when re-interrogated, remembered that he had witnessed the launch of a sixty-ton rocket and knew of another of twenty-five tons. He mentioned the involvement of the Askania company and of Peenemünde, and other circumstantial facts, all later proved accurate. During 1–5 June, four reports were received in London that substantiated, in one way or another, information on hand. They mentioned Rechlin, the Luftwaffe experimental station, Usedom, the island on which Peenemünde was located, described it as a German army, not Luftwaffe, establishment (important, because the rocket was an army weapon) and, in the last report, described the firing of three rockets, 50–60 feet long, from ‘testing pit No. 7’. Large pits, clearly visible on air photographs of Peenemünde, had puzzled the interpreters. The reference was misleading, since the rockets were fired from transporter-erectors positioned in the open, but it seemed to emphasise that the British should be interested in Peenemünde. This pot-pourri of information merely helped to harden attitudes among the investigators in Britain, not to elucidate. The positions were as follows: Duncan Sandys was fairly certain that the Germans were developing a rocket; R.V. Jones was uncertain but had an open mind; Lord Cherwell was absolutely convinced that a rocket was not technically feasible. His argument was fiercely reasonable: take-off would demand an enormous thrust; such thrust could only be supplied by an enormous charge of solid fuel inside a very large rocket; a very large rocket would need a conspicuous launch platform, either a ‘gun’ or a large ramp; no such structures had been identified; therefore the rocket did not exist. He dismissed the notion that the Germans might be using liquid fuel – he appears not to have studied Goddard’s pre-war experiments in America and to have been unaware of recent British experiments, conducted by Isaac Lubbeck for the Shell Petroleum Company – on the grounds that it would be impossible to control the flow of gases out of the rocket, which could not therefore be guided. Cherwell was to persist in this view until the contrary evidence became incontrovertible. Meanwhile, photograph reconnaissance of ‘cylindrical’ or ‘torpedo-like’ objects at Peenemünde accumulated; interpretation suggested dimensions of ‘38 feet by eight [in diameter]’, ‘40 feet by 4 feet thick’, ‘35 feet long with a blunt point’ (we now know the warhead had not been fitted), ‘a cylinder tapered at one end and provided with 3 radial fins at the other’. On 23 June a photographic mission returned with film of two ‘torpedo-like’ objects, both thirty-eight feet long, six feet in diameter and with three fins. These photographs proved critical in advancing the debate about what Peenemünde threatened. Sandys summarised the evidence in a report on 28 June. ‘The German long-range rocket has undoubtedly reached an advanced state of development . . . frequent firings are taking place at Peenemünde.’ Prisoner-of-war and agent reports implied a range of 130 miles, making it likely that it would be fired from the Pas de Calais, the part of northern France nearest London. Work of a suspicious nature – in fact the construction of a large concrete bunker – had been detected at Wissant. However, the report again grossly overestimated the rocket’s weight, at between sixty and a hundred tons, with a warhead of up to ten tons, and was still based on the suggestion that it was solid-fuelled. That was unfortunate, given that so much of the assessment was correct, for the continual false judgement could only lend weight to Cherwell’s dismissal of such a monster rocket’s existence. On 29 June the Defence Committee (Operations) of the Cabinet met in Churchill’s underground command centre in Whitehall. Sandys and Cherwell were present, so was Jones, so were the Chiefs of Staff and the Prime Minister. The meeting opened with a presentation of the most recent Peenemünde photographs, described by Sandys as providing conclusive evidence of the rocket’s existence. Cherwell responded by raising again his technical doubts, his warning that the signs observed might be decoys, and concluded by suggesting that, if there were a secret weapon, it was probably a pilotless aircraft. Jones, asked by Churchill to comment, then disconcerted Cherwell by coming down on the side of Sandys. Thitherto he had harboured real doubts, reinforced by the deference he owed to Cherwell as one of his former Oxford pupils. Now he declared himself convinced that the rocket existed. Cherwell raised the final objection that, if so, the ‘flash’ of its launch must have been observed, say by Swedish fishermen in Baltic waters. Since there were no reports of ‘flash’, there could be no rocket. His objection, however, rested on his fixed belief that launch speed could only be achieved by the detonation of a large charge of cordite. The committee chose not to consider the question of whether the Germans might have overcome the difficulty of using liquid fuel. Instead it accepted the probable evidence of the rocket and made three decisions: to continue even more vigorously the examination by every means of the area of northern France within 130 miles of London; to attack rocket-launching sites in that area as soon as they were located; and to bomb Peenemünde. The Peenemünde raid took place on the night of 17–18 August 1943. It was mounted by 433 Stirling, Halifax and Lancaster heavy bombers of RAF Bomber Command, while eight Mosquitoes staged a diversionary attack on Berlin. Earlier in the day the US Eighth Air Force had bombed Schweinfurt in southern Germany. The Germans were on the alert – a low-level British code they had cracked revealed that a night raid would take place – but they expected the target to be Bremen, another north German city, or Berlin. The sky was clear, though partly obscured by cloud over Peenemünde itself. Cloud would partially disrupt the British bombing pattern. The dropping of radar-confusing foil over Denmark by the Mosquitoes on their way to Berlin would distract the German night-fighter defence. Soon after midnight, the Pathfinders of the RAF bomber force began dropping their indicators on Peenemünde. Some fell astray, with the result that the aiming point moved southward, away from the test area at the tip of the island. One effect of the misplaced indication was to direct heavy bombing on to the camp occupied by foreign workers, killing several hundred. Nevertheless, many hits were achieved on the laboratories, the rocket factory and the scientists’ housing estate. About 120 of the scientific and technical staff were killed. In the aftermath, it was decided to move the technical facilities to Kochel, in Bavaria – Peter Wegener was one of the scientists transplanted – and the manufacture of the A-4 (V-2) to a new underground Central Works in the Harz Mountains at Nordhausen. Nordhausen was to be built and operated largely by foreign labour; but the destruction of the camp at Peenemünde not only killed apparently all the foreign workers who had supplied London with secret-weapon intelligence – several were Luxemburgers – but also ended the comparatively free conditions which had allowed them to communicate with British intelligence. Nevertheless, A-4 intelligence was not completely ended. The firing range was transferred to Blizna, a remote village in southern Poland, at the confluence of the Bug and Vistula rivers, and Polish agents’ reports were to keep the Crossbow Committee, as the British committee tracking the pilotless weapons’ development was known, supplied with information in the coming months. Meanwhile, perturbed by reports of ‘long-range guns’ and suggestions that mysterious buildings in both the Pas de Calais and the Cherbourg peninsula might be connected with the enemy’s secret weapons programme, the Allies were led to attack a conspicuous concrete building at Watten, in the Pas de Calais, on 27 August. It was almost completely devastated by the USAAF; later it was discovered to be a rocket store, not a launch site. Other sites, including a bunker at Siracourt and a ‘high-pressure pump gun’ battery at Mimoyecques, were to be destroyed by precision bombing in 1944. Contrary to what many people believe, the war was not fought just in Virginia, Pennsylvania, and Tennessee. In fact, a sprawling and very bloody war was fought west of the Mississippi River (in what was called the Trans-Mississippi Theater), in Indian Territory (in what is today largely the state of Oklahoma), and the New Mexico Territory. Even Minnesota witnessed a frenzy of killing in 1862. Prominent in much of this fighting were Native Americans. What is even less well known is that another civil war was fought across much of the West between various Indian tribes. The Union and Confederacy recruited and used Native Americans in different ways and for different reasons. Most served in and near Indian Territory and were used to combat Confederate efforts in that region. About 3,500 ultimately served in the Union Army between 1861 and 1865. Units included the 1st through 4th Regiment Indian Home Guard (although organization got underway for the 4th, the unit was never fully completed). Most of these men served on a variety of expeditions and to reinforce forts and far flung outposts. Each was mustered out in May 1865. The most prominent Union Indian was a member of the Seneca tribe named Ely Parker. An aide to General Ulysses S. Grant, Parker was promoted to general (one of two Indians who held that rank, the other being a Cherokee named Stand Watie who fought for the Confederacy) and was an eyewitness to Robert E. Lee’s surrender at Appomattox Court House on April 9, 1865. Parker never held a combat command. It is more difficult to calculate numbers for Confederate service because records are incomplete and record-keeping in this region was not carefully maintained. The South made alliances with tribes in Indian Territory to raise regiments for service, and to act as a buffer zone for other white troops serving in other states. Chief Stand Watie organized the 1st Cherokee Mounted Rifles and led his regiment in several battles, including Elkhorn Tavern (Pea Ridge) in Arkansas in early March 1862. There, his men captured several Union artillery pieces, but the atrocities committed against white soldiers, including scalping, were used by the press to demonize Native American participation in the war. 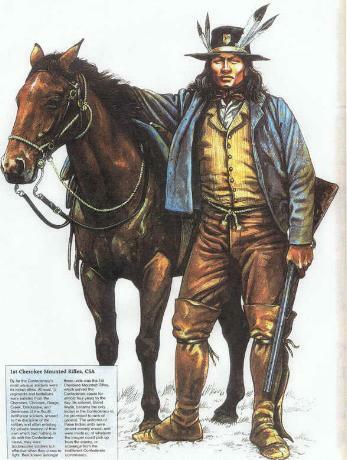 Watie led his men in dozens of small actions over a sprawling region. When he finally surrendered in June of 1865, it is believed he was the last general to officially do so. He died in 1871 and is buried in the Old Ridge Cemetery in Delaware County, Oklahoma. Literally scores of skirmishes and larger actions were fought on the land running from west of the Mississippi all the way to the New Mexico Territory. While the federal government was fighting to control the Apache in the New Mexico Territory, significant fighting broke out between major tribes over land rights, hunting issues, cultural matters, and traditional rivalries. The fact that some tribes aligned themselves with the Federal government while others threw their lot in with the Confederacy only served to fan the flames of hatred. As Indian fought Indian, other more famous actions broke out across the country. The Dakota War, in the summer of 1862 in Minnesota, was a short but brutal affair that began in August between eastern Sioux or Dakota and white settlers and Union troops. The fighting was put down within a short time, and the affair ended with the mass hanging of thirty-eight Dakota that December in Mankato, Minnesota. Because many of the white soldiers were shipped elsewhere to fight in the main civil war, Indians in Colorado used the occasion to launch hit-and-run raids against farmers and ranchers outside Denver. In an effort to end the threat, Colonel John Chivington led nearly 1,000 volunteers in a punitive expedition that attacked a village with hundreds of Arapaho and Cheyenne, including women and children. Chivington refused to take prisoners, which explains why the fighting is commonly called the Sand Creek Massacre. Because Indian Territory was so far from the Confederate capital in Richmond, Virginia, Southern authorities dedicated fewer resources and capable officers to supply and oversee it. It was also hard to transfer men and supplies across the Mississippi River, especially after the fall of Vicksburg and Port Hudson in the summer of 1863. The result was that pro-Confederate Indians found it increasingly difficult to battle Federal expeditions and raids. Native Americans who sided with the South suffered the most for their allegiance. All existing Federal treaties with Indian tribes who sided with the South were voided. Despite its efforts to enlist Indians, the Confederacy garnered few military benefits from its relationship with them. The Bohemians increasingly looked to Bethlen Gábor to save them. The Transylvanian prince had his eyes set on the Hungarian crown, always a more realistic prospect than the Bohemian one. He wrote to the Bohemians on 18 August 1619, announcing he would soon join them in Moravia. This was a ploy to win their support, which would improve his position in negotiations with the Hungarians who were meeting in Pressburg. A wave of re-conversions among the leading Magyar nobles of the western and north-western counties since 1608 had given the Catholics a majority in the diet again. However, neither they nor the Protestants wanted to be drawn into the Bohemian conflict. Bethlen posed as mediator, winning backing from disaffected Upper Hungarian Protestant magnates, like György Rákóczi and Counts Szaniszló and Imre Thurzó. His envoy persuaded the Ottoman grand vizier, Mehmed Pasha, to sanction war against the Habsburgs and promise Turkish infantry as auxiliaries. Bethlen’s intervention betrayed the problems that would bedevil all Transylvanian involvement in the war. He was convinced Frederick and the Bohemians were rich and would provide the subsidies he needed to keep his largely irregular cavalry army in the field and pay for the infantry and artillery required to take the Habsburg fortresses. For their part, Frederick and his advisers saw what they wanted: a man who claimed to have read the Bible 26 times had to be a crusader of the righteous against Habsburg Catholic tyranny. Bethlen had already demanded 400,000 talers and all of Inner Austria in June, but decided to start operations before Frederick agreed, since he needed a tangible success to convince the Bohemians and the sultan to back him. He left Cluj (Klausenburg) on 26 August with 35,000 men, while Rákóczi entered Kassa unopposed with 5,000 Upper Hungarians a week later. György Széchy and other Upper Hungarian supporters threatened Pressburg to disrupt the efforts of the loyalist Hungarian palatine, Sigismund Forgách, to organize resistance. The Upper Hungarian mining towns declared for Bethlen, but he delayed his own advance to convene a special assembly of supporters at Kassa who declared him ‘Protector of Hungary’ on 21 September, effectively deposing Forgách. Ferenc Rhédey was sent with over 12,000 horsemen across the Little Carpathians into Moravia, while Bethlen resumed his advance with the rest of his army towards Pressburg, destroying a Habsburg detachment sent to save it. The situation looked dire for the Habsburgs. Garrisons along the Military Frontier declared for Bethlen, leaving only Komorn, Raab and Neutra loyal. Forgách could muster only 2,500 men in the field, while a mere 2,650 under Archduke Leopold held Vienna with a further 560 in Krems and the other Danube towns. Bucquoy and the main army of 17,770 was away around Tabor and Pisek in south-west Bohemia, with Dampierre and 8,600 along the Moravian frontier. The timing was significant. Ferdinand was still on his way back from his coronation in Frankfurt, while the Bohemians had just declared their Confederation and elected Frederick. Bucquoy was obliged to abandon his advance against Prague, leave 5,000 men to hold his current positions and race with the rest to save Vienna. Panic again gripped the Lower Austrian population as Bethlen’s light cavalry crossed the Danube at Pressburg and swarmed across the area to the south during late October. Refugees crowded into the city, while the rich fled over the Alps. Bucquoy had joined Dampierre, but decided not to risk the emperor’s only army as it was outnumbered three to two by Hohenlohe, Thurn and Rhédey approaching from Moravia. He retreated across the Danube at Vienna, burning the bridge on 25 October. Though they controlled the entire north bank, the Confederates could not reach the city on the other side, and were obliged to march east to cross downstream at Pressburg. Bethlen used the lull to consolidate his position in Hungary. Having captured Forgách at Pressburg, he forced him to convene a diet on 18 November to start the process of deposing Ferdinand as king. The Confederates finally crossed the river on 21 November, and moved west again on the south side, defeating Bucquoy’s attempt to delay them at Bruck five days later. The Lower Austrian Protestants moved 3,000 men east towards Krems, cutting the Habsburg forces off from the other side. The attack on Transylvania followed long Habsburg efforts to enlist Polish support. Poland was potentially a more important ally than Spain, and Sigismund III was as devout a Catholic as Philip III. Poland’s military power was to be demonstrated in 1621 when it was to raise an army of 45,000 backed by 40,000 Cossacks. More significantly, Poland bordered on Silesia and Hungary, placing it in a direct position to help, and it had signed a mutual assistance pact in 1613 promising aid against rebellions. As Emperor Ferdinand’s sister, the Polish queen naturally championed intervention, but the king remained undecided. 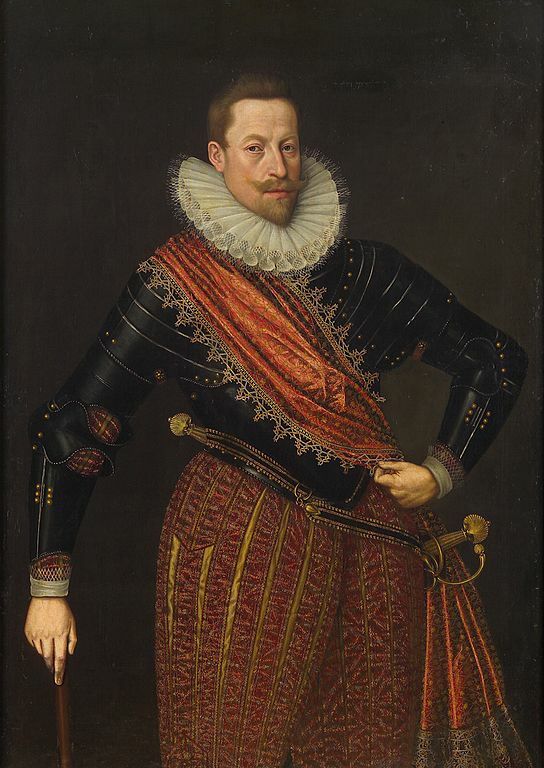 His own ambitions remained firmly fixed on the Baltic and he was disappointed at his in-law’s lack of assistance when Sweden invaded Livonia in 1617–18. (Ferdinand would again fail to help against a second invasion in 1621.) Sigismund also had to consider his nobles who preferred raiding against their traditional targets, the Turks and Muscovites. However, the Russians had made peace in December 1618, widening Sigismund’s options. Many Polish clergy were receptive to Habsburg arguments that the Protestant Bohemians posed a common threat. Sigismund had instructed his son Wladyslaw to decline a Bohemian invitation to stand in their royal election. As the situation worsened during 1619, Ferdinand held out inducements, including an offer to relinquish the bishopric of Breslau to Poland. Many Polish historians regard the Thirty Years War as a lost opportunity, arguing that Sigismund should have accepted this offer, or grabbed Silesia by playing the role later adopted by Sweden and joining the German Protestants. Sigismund had no such plans. Instead, he sought a way of satisfying the Polish pro-Habsburg lobby without committing himself to a long war that would distract from his primary objective of recovering Sweden. The leaders of the Sejm agreed, because limited intervention provided a way of removing the 30,000 unpaid Cossacks. These troops had been discharged after the recent war with Russia and their raiding across the southern frontier risked provoking a new conflict with the sultan. The Cossacks have entered history as the Lisowczycy, after their original commander, Aleksander Lisowczycy, a Lithuanian veteran who commanded a regiment in the Russian war. The Lisowczycy were the kind of cavalry that ‘God would not want and the Devil was afraid of’. Unlike the traditional Polish cavalry, they wore no body armour, relying on speed and fake retreats to lure opponents into traps. They were happy to be paid, but also fought for booty, deliberately terrorizing civilians into submission. The Habsburg ambassador intended to recruit the Cossacks to reinforce the imperial army, but they were reluctant to serve too far from home in a land they considered full of impregnable fortresses where plunder would be hard to take. Plans were changed so that 4,000 Lisowczycy joined 3,000 other Cossacks recruited by György Homonnai, an Upper Hungarian magnate who was also a member of the Transylvanian Estates and a personal enemy of Bethlen, who he believed had cheated him in that country’s election of 1613. Having been driven into exile, Homonnai had already fostered two failed rebellions. He now struck across from his estates in Podolia at the end of October 1619. Bethlen had left Rákóczi with only 4,000 men in Transylvania, refusing to believe Homonnai posed a threat. The two armies met near Ztropka (Stropkow in modern Slovakia) on 22 November, where Rákóczi’s men were routed after they mistook the classic feigned retreat for the real thing. Homonnai’s attack fuelled an already volatile situation in east Central Europe. Despite the grand vizier’s promise, the Ottomans had hesitated to break their truce with the Habsburgs. 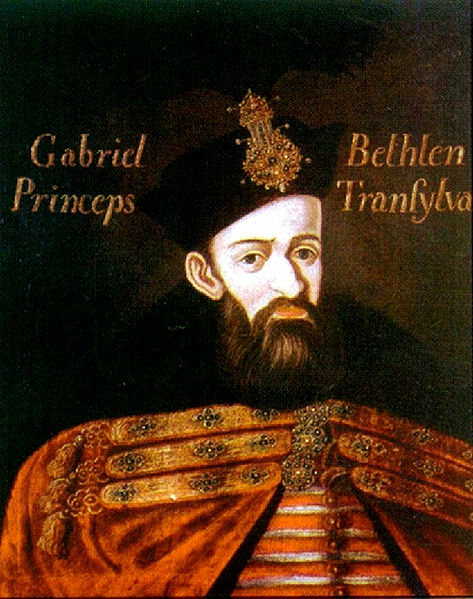 Nonetheless, they regarded Bethlen as their client and did not want him driven from Transylvania, especially by the Poles who were already interfering in neighbouring Moldavia. 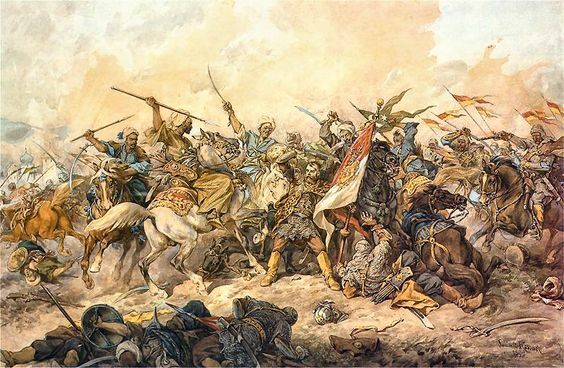 Peace had just been concluded with Persia, allowing the sultan to send the Tartars, backed by Ottoman regulars, into Moldavia where they routed a Polish relief force at Cecora in October 1620. Sigismund sent a huge army the following year that entrenched at Chocim (Hotim) on the Dneister and managed to repel almost twice its number of Tartars and Turks. Fresh problems with Sweden forced Sigismund to agree peace later in 1621, restoring the pre-1619 situation, though Poland had to accept the sultan’s candidate as prince of Moldavia. This conflict was separate from the Thirty Years War, but nonetheless proved significant for the Empire in preventing Poland and the Ottomans from intervening. The threat to Bethlen was already receding before he left his camp outside Vienna. He had arrested most of Homonnai’s supporters after the earlier rebellions. Finding few willing to support him, Homonnai was already in retreat by 2 December. With the wider situation remaining unclear, Bethlen was nonetheless forced to accept the mediation of the Hungarian diet, agreeing an eight-month truce with Ferdinand on 16 January 1620. Bethlen remained a threat to Ferdinand, but the immediate danger had passed. Sigismund refused to allow the Lisowczycy back into Poland, and redirected them along the mountains into Silesia to join the imperial army. Five detachments totalling 19,000 fighters set out between January and July 1620, though some were intercepted by the Silesian militia. The steady reinforcement enabled Bucquoy to resume the offensive, launching three attacks from Krems in March, April and early June against Thurn’s Bohemians and Austrians entrenched around Langenlois to the north. The Silesians and Moravians returned, bringing the Confederate army up to 25,000 by May when Anhalt arrived to take command. They were joined by 8,000 Hungarian and Transylvanian cavalry sent by Bethlen who, despite Ferdinand’s generous terms, still distrusted the emperor and decided to re-enter the war. Bethlen and Frederick had already sent a joint delegation to Constantinople in March 1620 to seek Ottoman assistance for the revolt. Mehmed Aga reached Prague in July to deliver the sultan’s belated congratulations on Frederick’s coronation. He asked to see where the Defenestration had taken place and enthusiastically promised 60,000 Ottoman auxiliaries for Bohemia. Many in Prague were deeply uncomfortable with courting the Ottomans, yet the leadership was seduced by the fantastical scheme of a grand alliance smashing both Poland and the Habsburgs. Scultetus did a theological somersault to stress common ground between Calvinism and Islam, while Baron Tschernembl argued any means were justified provided they saved the true cause from the papists. Despite misgivings, Frederick wrote to the sultan on 12 July, making Bohemia a tributary state of the Ottoman empire in return for assistance. A delegation of a hundred Bohemians, Hungarians and Transylvanians set out for Constantinople with 70,000 fl. in bribes to seal the deal. Meanwhile, Frederick promised 300,000 fl. to Bethlen, even pawning his jewels to raise the first instalment. With support growing, and having easily repulsed another attack by Homonnai in August 1620, Bethlen seized control of the diet at Neusohl in Upper Hungary. This had convened in May at Ferdinand’s request to broker peace among all Hungarians. Bethlen’s supporters declared the abolition of the clerical Estate and the confiscation of the property of all who opposed them. Ferdinand ordered the diet to disband on 13 August. Twelve days later, Bethlen’s supporters elected him king of Hungary. Throughout, the solidly Catholic Croatian diet (Sabor) rejected the Hungarians’ overtures and aligned itself with its Inner Austrian neighbours, still loyal to the Habsburgs. Plans were being concocted for a one-man midget which could be released while the mother submarine was submerged. During the winter of 1942-43 two naval officers, lieutenants Nishina and Kuroki, and a naval architect Hiroshi Suzukawa drafted a design based on the Type 93 Long Lance. All the major components of the original torpedo were retained, and the only major modification was the inclusion of an additional section between the warhead in the nose and the oxygen motor. This was the pilot’s compartment, fitted with a periscope and a set of controls enabling a man to direct the torpedo run. By the spring of 1943 the designers had completed their drawings, and had calculated that their ‘manned’ torpedo, fitted with a 3,000 pound high explosive warhead, would have a range of forty nautical miles. The Long Lance had already proved it could break the back of a heavy cruiser with a man to direct it and a warhead three times more powerful there was every reason to suppose it could do the same to a battleship or an aircraft carrier. Things had already started to go badly for the Imperial Navy and the Naval General Staff in Tokyo were looking for some way of changing the pattern of the Pacific war. The plans were presented for what the designers were now calling the kaiten. (The literal translation of kaiten is ‘Heaven Shaker’. But in Japanese it means much more – suggesting a radical change in affairs.) But they were rejected as being too fantastic even But when the for consideration. Imperial Navy’s attempt to smash the Americans at Saipan went awry the men in Tokyo began to have second thoughts about the kaiten. Nishina and Kuroki’s persistent pleas to the Navy Ministry had culminated in a petition written in their own if this had much what undoubtedly caused the Naval General Staff to listen was what the Americans termed the ‘Marianas Turkey Shoot.’ when over blood. It is doubtful effect; 400 Japanese planes were lost. Thirteen months after they first sought it, permission was given for the construction of a prototype. But only on condition that it should have an escape hatch giving the kaiten pilot a chance to get away safely once he had put his weapon on a sure course to the tar- get. In February 1944 the prototype was approved and a base was set up on Otsujima Island near the Kure naval base, headquarters of Japan’s Sixth Fleet and submarine force. Strict security measures kept news of the project out of the public eye and only a few kaiten had been built by June 1944. But when the extent of the disaster which had overtaken the Imperial Navy in the Marianas finally dawned on them, the Naval General Staff sent out a frantic order for more to be produced on a crash priority. A second order called for volunteers to operate a Kyukoko heiki, a new national salvation weapon, on missions from which they were not expected to return alive. At first no mention was made of the nature of the weapon, but even when it was learned that their probable fate was an unseen death beneath the waves there were plenty of volunteers. Indeed it appears that the first ones were grateful at being accepted. Selection was supposedly based on three qualifications: physical and moral strength, evidence of strong sense of patriotism, and a minimum of family responsibilities. Married men were excluded and very few elder or only sons were chosen. The accent was on young fit men who would have little tendency to look over their shoulders. At the kaiten depot on Otsushima, ‘Base P’, every effort was made to instill esprit de corps, Yamato damashii, Japanese spirit, in the volunteers. On arrival they were introduced to a prototype of their steel coffins before being shown to their quarters. The latter were, like their food, luxurious in comparison with what most of them had known in their previous training. But there were few recreation facilities – no cinema and no women. Nor were the men permitted leave of absence until they had completed their training, and were ready for the mission which was to be their finale. Nishina and Kuroki organised the training of the first volunteers. But on 6th September, 1944, the kaiten claimed its first victim when Kuroki’s torpedo stuck in the mud at the bottom of the placid waters of the Inland Sea. Six other lives were to be lost in training before the end of the war brought the demise of the kaiten. But, from September 1944 until the end of the Okinawa campaign, volunteers in groups which were given traditional names such as ‘God’s warriors’, ‘Group for the furtherance of the Samurai way’, took kaiten courses at Otsushima. Lessons in the functions of the Type 93 torpedo were followed by simulated dry run missions to familiarise the pilots with the controls and accustom them to the confined space of their tiny cabin. Submerged practice drill against ships moored in Tokuyami Bay followed. Finally, when the pilots were considered proficient at these drills, the group was embarked on one of the fleet submarines for an operational dummy run. Each of the I class submarines fitted to carry kaiten could take six of the weapons. During the approach to the target the kaiten pilots climbed into their tiny craft through a special hatch which was then sealed off. As the submarine closed on its victim, a telephone link between the submarine’s conning tower and the kaiten enabled the captain to keep the pilots informed on the relative positions of the target. At the optimum moment the kaiten’s engines were started and they were released at five-second intervals from the mother ship. Once in motion the pilot could observe the target through his own periscope, and make the necessary corrections to his course. 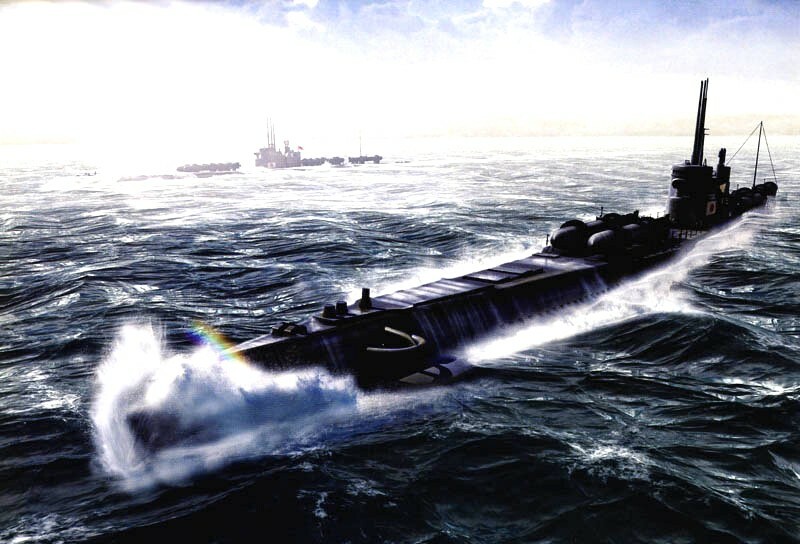 Then at about 500 yards distance he would switch his craft on to automatic control for the final dash at full speed submerged to a depth of about twelve feet. Inside the kaiten even a small man was cramped. And, although the controls were simple, considerable skill needed to operate the craft Under his feet was a tiny box of emergency rations and a small flask of Japanese whiskey. Neither was intended for operational missions. Directly in front of the pilot’s face was the viewing glass of the short, stubby periscope which was raised or lowered by a crank on the right. Also on the right but above the pilot’s head was the valve regulating the oxygen flow to the motor immediately behind him. Overhead on the left was a lever connected with the kaiten’s diving planes, which controlled the rate of descent or climb underwater. Below efficiently. was a valve for letting in sea water. This was necessary to maintain stability as the oxygen fuel was used up. Finally, there was the rudder control lever which steered the weapon right or left and which was the last control to be touched by the pilot when he set his final course for an enemy ship. To operate the kaiten efficiently a man really needed six hands. And about the same number of eyes for watching the control panel. Apart from the periscope there was a gyrocompass, a clock, and depth and fuel gauges. Any sudden change in the controls or contact with an underwater obstacle invariably resulted in the pilot banging his head on one or other of the instruments. In consequence, bandaged heads were a frequent sight on Otsushima. On an operational mission the captain of the mother submarine would align his ship with the target and this lever man would check his compass bearing. In the conning tower each kaiten the attack course of each individual kaiten would then be plotted and relayed by telephone. For example a typical order might be ‘Go right thirty degrees on leaving. Speed twenty-five knots for twelve minutes and thirty seconds.’ These instructions were designed to bring the kaiten to within 500 yards of his target, at which point the pilot was expected to raise his periscope and set the controls for his dash for the enemy ship’s vitals at the top speed of forty knots. Training finished with the successful completion of an operational dummy run. The kaiten men were then entitled to a few days leave before assignment to an operational mission. On this leave they were not expected to reveal the fact that they were now committed to a suicide operation. Nevertheless many of the families of such men appear to have guessed the reason for the special leave even if they were not told. Any suspicions they may have had would often be confirmed by little luxuries with which their relative was laden when he arrived. When the leave was over it was not considered good taste to mention that the next meeting would probably be at Yasukuni. But no doubt the thought was there. News that the Americans had seized Ulithi Atoll in the Carolines, where a deep water anchorage would provide an ideal fleet base, prompted the Japanese to launch their first kaiten attack. Twelve of the newly trained would-be suicides were selected for the strike. Among’ them was one of the two inventors of the weapon. Lieutenant Sekio Nishina. Determined to show the worth of his innovation Nishina was taking along a box containing the ashes of his deceased co-inventor. This would ensure that both would go to Kudan and be enshrined at Yasukuni together. A dedication ceremony was conducted at the Otsujima base during the afternoon of 7th November 1944. Vice-Admiral Shigeyoshi Miwa, commander of the Imperial Sixth Fleet, supervised the proceedings and explained the forthcoming operation to the kaiten pilots. Three fleet sub marines, the I-36, I-37, and I-47, which were in the bay nearby, would transport four kaiten each to the vicinity of Ulithi where large numbers of American ships were reported to be concentrating. The kaiten pilots were to sink the biggest ships they could. A presentation of short swords and hachimakis followed, and that night there was a party for the twelve doomed men. Next morning they 9am the I-36 led the three I-class submarines out of the harbour. As they steamed slowly up the channel the crews on other ships lined the rails shouting ‘banzai’ and waving their caps in a farewell gesture. The three submarines parted company not long after leaving port. I-37 was to proceed towards Kossol Passage in the Palaus, to attack Allied shipping there. I-36 and I-47 meanwhile would head straight for Ulithi. Their mission was to attack the American invasion fleet at anchor, launching their kaiten at through two different entrances to the atoll’s giant lagoon. But I-37 was fated not to reach her destination. Despite having six lookouts on the bridge whenever she surfaced she was spotted by the American destroyer Nicholas on 12th November. In a sudden and unexpected attack the I-37 was caught before she could dive and take evasive action. I-47 was under command of Lieutenant-Commander Zenji Orita, one of Japan’s ace submarine captains. He steamed slowly for his destination, making twenty knots on the surface, until he came within range of the American patrol planes. He then submerged by day, surfacing at night to charge his ship’s batteries and to pick up radio reports from Sixth Fleet headquarters at Kure. His ship and I-36 were working in close cooperation with reconnaissance planes from Truk. They would provide reports on American shipping at Ulithi. On 17th November the I-17’s radio picked up a message relayed by Tokyo reporting that one of the reconnaissance planes had seen a vast concentration of American ships at Ulithi on the previous day. According to the pilot they appeared to be anchored in three groups, and he had seen battleships and carriers among them. Next day, fifty miles west of Ulithi, Captain Orita surfaced so that the Kaiten could be given a final check. All four were found to be in good working order. By noon on the 19th the sub- marine had closed to within a mile of the southern entrance of the Ulithi lagoon, and at midnight the four Kaiten pilots began making their final preparations. Last minute messages were written and handed to Orita together with their wills; finally all four men wound their hachimakis round their heads. Ensigns Akira Sato and Kozo Watanabe climbed into their kaiten at midnight while the submarine wallowed quietly on the surface. Lieutenants Nishina and Fukuda were able to defer their entry, because there were access tubes to their weapons from the submarine. (Access tubes to all kaiten were provided on later sorties, so that the submarine could remain submerged.) When the lids of their weapons had clanged shut, Orita dipped I-47 beneath the waves and then edged the submarine stealthily forward to the very en- trance of the lagoon. This manoeuv- ring occupied three hours, during which Sato and Watanabe sat in their kaiten – their only contact with the world outside being two telephone cables. At 3am Nishina and Fukuda struggled through the access tubes to their kaiten, Numbers One and Two. All was now set for the attack. Four cables bound each kaiten to the submarine’s deck during the voyage. Two of these had been loosened when the I-47 surfaced at midnight; the other two could be released from inside the submarine. At 4am Captain Orita, guided by the twinkle of welding torches on the US ships which he could see in his periscope, declared that he was in the firing position. Over the telephone lines the four kaiten men reported they were ready for action. ‘Kaiten Number One stand by, start your engine!’ ordered Orita. ‘Standing by’, came Lieutenant Nishina’s soft voice over the circuit. The third cable on Number One kaiten was loosened. ‘Start your engine!’ said Orita. Inside the submarine, a motor sound could be heard. The fourth cable was loosened. It was 4.15am, 20th November 1944. Captain Orita, peering through his periscope, could see just a trace of bubbling water for a moment, as Nishina’s kaiten moved off. Final checks of position, depth and the course Nishima was to follow had been made. He was now on his run-in, under orders to penetrate as deep into the anchorage as he could before raising his periscope and selecting a target for attack. Ensign Sato left at 4.20, followed by Watanabe and Fukuda at five minute intervals. The second and the third kaiten were to get inside, then move off to the right and left, respectively. Fukuda was to attack when just inside the lagoon. This, it was hoped, would throw the Americans into a panic, when ships began exploding at widely separated points. The last words heard from kaiten pilots in I-47’s conning tower were Fukunda’s, ‘Tenno heika banzai!’. Long Emperor! The four kaiten forged towards their targets at about thirty knots. Mean- time the barely submerged I-47, live the suddenly freed of twelve tons of metal, lurched towards the surface. Orita submerged again to periscope depth and headed south-east. He had wanted to be well away from the of the anchorage when the kaiten completed their mission. He also wanted a clear view of what happened to take back to Japan. Thus at 5am, the I-47 surfaced again. It was pre-dawn twilight and the crew was edgy, for daylight comes quickly in the South Pacific. The minutes ticked past. Then, at 5.07, an orange flash blossomed over Ulithi, and there was a distinct boom from well within the lagoon where Nishina was supposed to hit a target. At 5.11 another flash set the submarine’s crew banzaiing. The appearance of an American destroyer soon stopped that, however. Orita dived, but when the absence of depth charges suggested the submarine had not been spotted he surfaced again. The sun was now up and the destroyer could be seen threading its way through the entrance to the Ulithi anchorage. At 5.52 the dull thud of another explosion was reported by I-47’s sonar as coming from the atoll. It seemed that at least three of the kaiten had scored hits on something. Whether their missions were successful or not Orita concluded that all four pilots were now dead, and at 6am he ordered a silent minute of prayer for their souls. Then he dipped his ship beneath the waters and headed for home. I-36 was not so lucky. Lieutenant- Commander Teramoto, the captain, shut Ensigns Taichi Imanishi and Yoshihiko Kudo into their kaiten from the deck shortly after midnight. At 3am Lieutenants Kentaro Yoshimoto and Kazuihisa Touozumi climbed into their craft through the access tubes. Everything seemed to be going well until I-36 reached the point designated for launching, just off the eastern entrance to the Ulithi lagoon. There, at the very moment set for firing kaiten Numbers One and Two were found to be stuck fast in their racks. They could not be freed after their engines had started. Then the pilot of kaiten Number Four reported that his craft was leaking badly. The only weapon that could be despatched was Ensign Imanishi in Number Three, who was launched at 4.54am. Yoshimoto and Toyozumi returned to the submarine through their access tubes, and the I-36 surfaced briefly to take in Kudo. At this point the captain decided no more could be achieved, and when the I-36 submerged he turned her bow towards the open sea. Shutting off all the motors the crew listened intently. At 5.45am an explosion was heard, and at 6.05 another. Soon afterwards a pattern of depth charges rocked the I-36 and Teramoto decided it would be wise to get away from the area. But the I-36 was compelled to stay submerged while American destroyers overhead methodically searched the area for the submarine which they thought had fired conventional torpedoes from the eastern entrance. Nineteen hours passed. By that time the air in the submarine was foul with fumes, and the crew was exhausted. 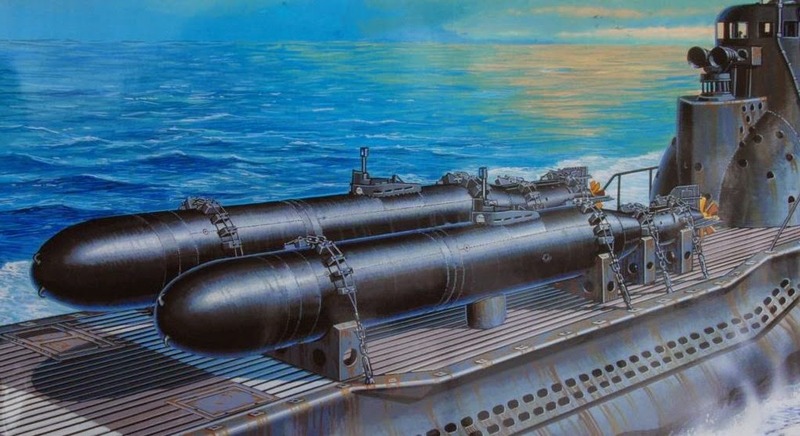 No depth charges had been heard for more than an hour, and Teramoto decided that he would have to surface to get fresh air and charge his batteries. Shortly before midnight the tanks were blown and the vessel surfaced. It was dark night and as there was no sign of American ships Teramoto took a risk. Running north on the surface at maximum speed, he cleared the area without further incident. This was the conclusion the audience wanted to hear, and there was a great outburst of banzais. The Japanese high command had ordered kaiten to be produced in quantity, and news that the first strike had been an outstanding success was a great boost to the morale of the scores of young men in training. ‘Die for the Emperor, but not in vain’ was a good motto. Every embryo Kaiten pilot was positively looking forward to his death-dealing mission, when the news was circulated. The Japanese estimate of ships destroyed was a complete fabrication. The only ship sunk in the operation was the US tanker Mississinewa. Book "The Cross in the Sky"
War has a way of masking the stage with scenery crudely daubed with fearsome apparitions.